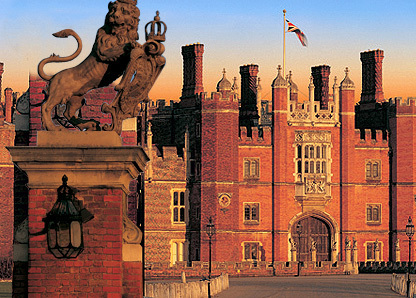 Hampton Court is probably the most famous of the remaining Tudor palaces and was one of Henry VIII’s personal favourites. It is located in Middlesex in the royal borough of Richmond upon Thames and was originally built as the home of Cardinal Thomas Wolsey. Wolsey took possession of the Hampton Court site in 1514 and spent the next seven years building the magnificent palace. He was responsible for building the Great Gatehouse which still exists today and is the first thing you see as you arrive at Hampton Court. When Wolsey started to fall out of favour in 1529 he passed over possession of the palace to Henry VIII as a gift. Within 6 months Henry VIII had started his own renovation and expansion project. One of the first things he did was to build the vast kitchens so the palace could accommodate his court of over 1000 people and be turned into a primary residence. His other additions included tennis courts, bowling alleys, a jousting tiltyard, the Great Watching Chamber and the Great Hall. All in all Henry spent around £60,000 over ten years on his renovations, which is equivalent to about £19 million in today’s money. Sadly out of all of Henry’s renovations only the Great Kitchens and Great Hall survive today. In the 17th century, during the time of the Stuarts, Hampton Court fell out of favour because it seemed old fashioned compared to the standards of the French Court. Shortly after William III and Mary II ascended to the throne in 1689 they undertook a massive renovation project to turn Hampton Court into a palace to rival Versailles. Work was halted in 1694 and this has left Hampton court with 2 distinct architectural styles, Tudor and Baroque. In her book, A Visitors Companion to Tudor England, historian Susannah Lipscombe tells us there are still clues all around Hampton Court of Henry VIII’s wives. The pomegranate of Katherine of Aragon can be seen above the buttery door and there are leather mache badges in the Great Watching Chamber of which Jane Seymour’s badge of a crowned phoenix rising from flames can be seen. You can also still see Anne Boleyn’s heraldic beast, the falcon, in the high rafters of the Great Hall. These were left behind by the builders who had to quickly replace Anne’s falcon with Jane Seymour’s panther after she became Henry’s new wife. Hampton Court was the palace where Henry’s longed for heir, the future Edward VI, was born and christened in 1537 so it was bound to hold some significance for him. It’s therefore not surprising that Hampton Court is the setting of the famous family portrait from 1545. Featuring Jane Seymour but commissioned after her death it’s believed to show Henry’s idea of a perfect family, with his favourite wife, in his favourite palace. Today Hampton Court is open to visitors and often hosts Tudor related events and exhibitions so people can learn more about Henry VIII and his court. Despite the many renovations and mixture of styles introduced by William and May clues still remain that give you a taste of what this magnificent palace was like in its Tudor heyday. There are beautiful Tudor roses carved into a pair of remaining tower domes, showing the extravagant tastes of Henry VIII. A griffin adorns a fireplace that was built by Wolsey for Katherine of Aragon and bears his motto Dominus Michi Adiutor (The Lord is my helper) You can also still visit Henry VIII’s bedroom which despite having undergone numerous renovations is still nevertheless the place he spent time in and which led onto his private study, library and jewel house. You can purchase Susannah Lipscombe’s book, A Visitors Companion to Tudor England, from Amazon if you want to find out more about Hampton Court and other Tudor places of interest.